Located at the centre of the old town in Ohrid, St. Sophia Church is one of the most impressive medieval buildings in Ohrid and a unique work of architecture of the Byzantine era. 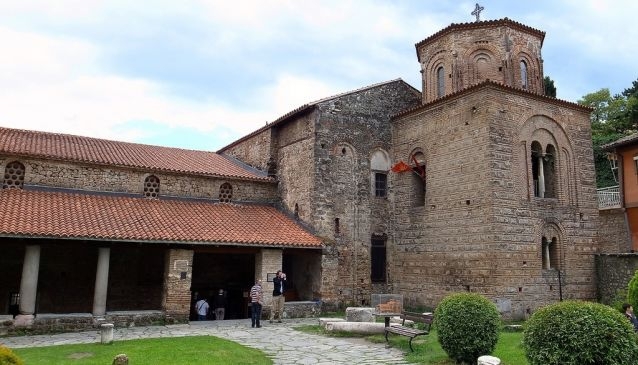 St. Sophia is a large three-nave cathedral with a dome at the centre, built on the foundation of an old cult during the period of King Samuil, it's been a cathedral church of the Ohrid Archbishopric for a long time. The frescoes in the St. Sophia church are characterized by the postures of the figures and the archaic forms, united in an artistic and iconographic whole, unique to church painting of the time. Since its builders blessed it with wonderful acoustics, St Sophia and its front garden are the main stage of the annual Ohrid Summer Festival and many other festivals. Just being a part of these events is considered a privilege and the experience is something that you will remember for the rest of your life.